Hotel Bohemiaz Resort and Spa Kampot. 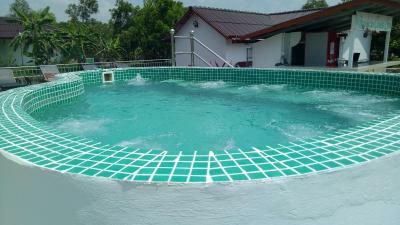 Lock in a great price for Bohemiaz Resort and Spa Kampot. – rated 8 by recent guests! The nature-colored pool was something special. I think it's the people there, that make this place a very special locating. There is something in the air, like a big family. A wonderful colourful oasis outside of the town and up towards the mountain on a little dusty road. 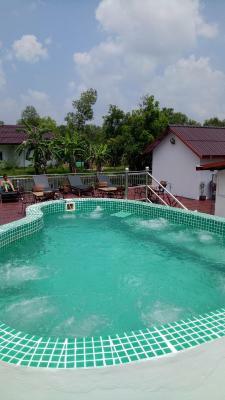 The natural mountain water swimming pool was lovely and the rooms were very comfortable. 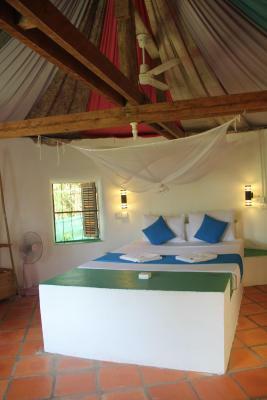 Most of our rooms were in the white thatched huts and we also had two of the hobbit nests which were cosy and quirky. Food was also great! The atmosphere and food were good. The bungalows are nice enough. Bohemian sums it up . They have a little problem with the electricity sometimes. 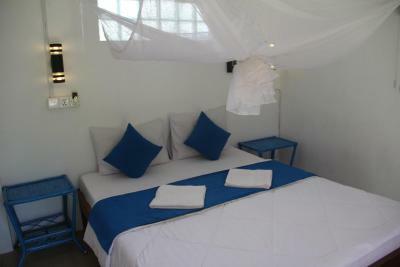 Bohemiaz is a happy and welcoming place for couples or families. 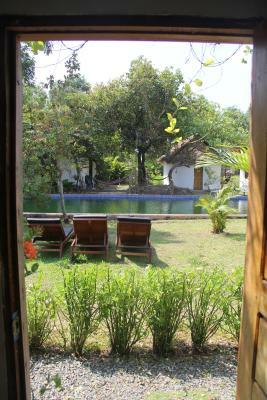 Beautiful grounds, cute eco pool, and best of all friendly people. Great food, too! That they had a sauna and steam room however we didn't have time to use it so cannot confirm how good it is. Restaurant seemed to have good menu but we didn't have time to try it. Rooms and general place was spacious. The bungalow in whichI stayed was very nice. 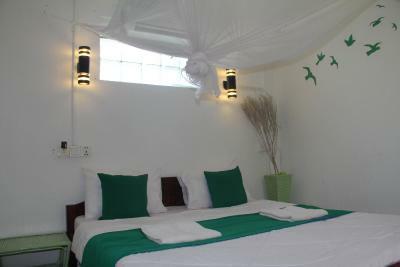 Mosquito net, fan, attached bathroom w/ hot shower, TV with Netflix available. The food was very nice and I loved all the animals on the property. And it was convenient to book a day tour of kampot countryside/ Kep. 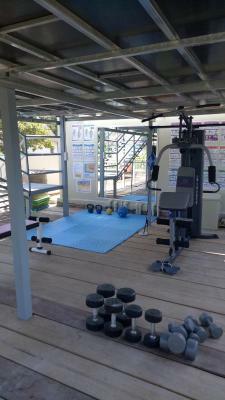 The place looks very nice, they have a pool, a sauna, a gym and yoga classes for free. Food is good. 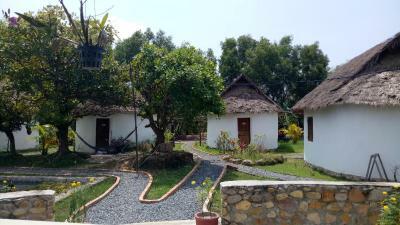 Bohemiaz Resort and Spa Kampot. This rating is a reflection of how the property compares to the industry standard when it comes to price, facilities and services available. It's based on a self-evaluation by the property. Use this rating to help choose your stay! 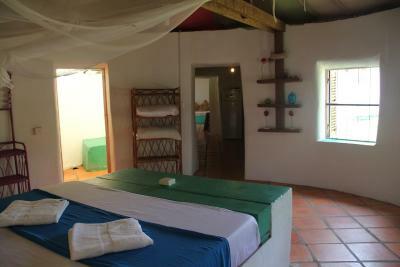 Overlooking scenic mountain views, rooms will provide you with a fan, mosquito nets and tile flooring. Bathroom facilities are equipped with shower facilities. 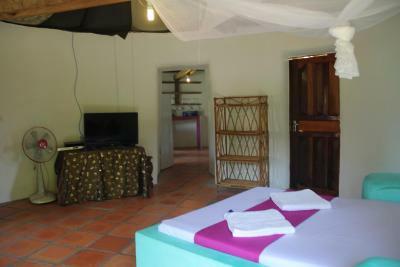 Refillable bottles of water and bamboo straws are offered for guests staying at Bohemiaz Kampot. Other facilities include a 24-hour front desk, barbecue facilities and free access to the fitness center which provides a hot tub, steam room, sauna, sun deck and plunge pool. 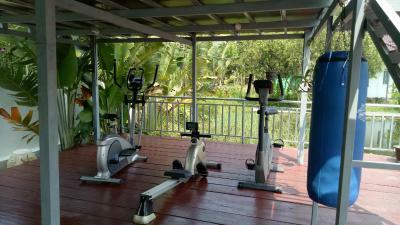 Guests can enjoy a variety of exercise classes at an extra fee. There are also treatment rooms where guests can indulge in a range of massages and body treatments at an additional charge. Free parking facilities are offered those who drive. This charming Cambodian-style accommodations is about 4.3 mi away from the entrance of Bokor National Park and 12 mi from Kep Beach. 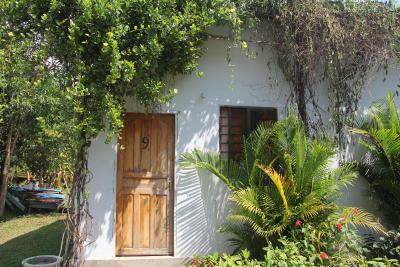 This property is also rated for the best value in Kampot! Guests are getting more for their money when compared to other properties in this city. 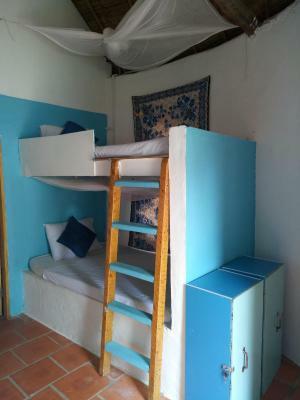 When would you like to stay at Bohemiaz Resort and Spa Kampot.? Fitted with a king-size bed, this fan-cooled room has tile flooring and an private bathroom with heated showers. Fitted with 4 single beds, this fan-cooled room has tile flooring and an private bathroom with heated showers. This apartment has a sofa, kitchenware and kitchen. This bed in dormitory features a view, tile/marble floor and private entrance. An Inside Look at Bohemiaz Resort and Spa Kampot. 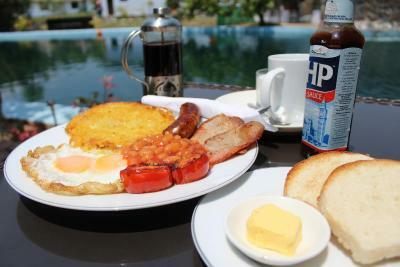 4 reasons to choose Bohemiaz Resort and Spa Kampot. 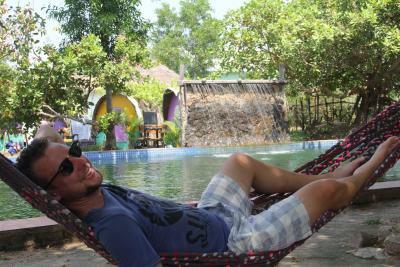 House Rules Bohemiaz Resort and Spa Kampot. takes special requests – add in the next step! Bohemiaz Resort and Spa Kampot. accepts these cards and reserves the right to temporarily hold an amount prior to arrival. 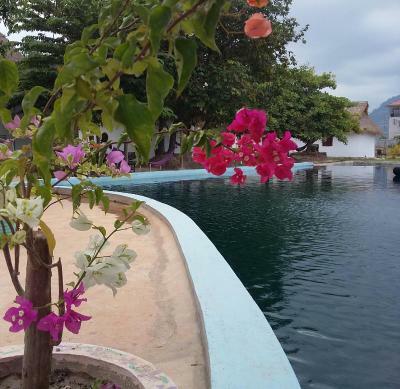 See all guest reviews for Bohemiaz Resort and Spa Kampot. 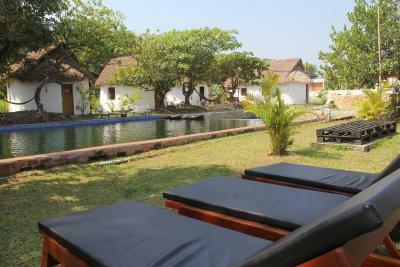 Newest Reviews for Bohemiaz Resort and Spa Kampot. The natural pool is not one that looks appealing to swim in, it’s very dirty and murky water so we didn’t want to take a dive. The menu is quite expensive and because it’s quite far out of town it’s your only option really unless you want to spend even more on a tuk tuk there and back. When we asked if we could stay another night they told us they had no rooms apart from more expensive $15 ones even though they had the same cheaper rooms available online. The facilities were really good, the spa wasn’t open for treatments as it was a public holiday but the jacuzzi pool, steam room and sauna were great! The layout and rooms were beautiful and the little hobbit huts were particularly charming. For the price it was very good to get use of the spa area included. Plastic straws. Carton juice (not fresh). No air-con in the room or enough fans in the restaurant. Many Huntsman spiders in the bungalow roof. The friendly staff. The natural pool. The excellent food. We booked a room and travelled all day to get there. When we tried to check in they told us there was a problem with the room and all others were full. They tried then to move us to their other hotel much further away from the Central City, absolutely not walking distance. Not a good experience at all, they could have emailed us prior to trying to check in. Ended up booking another hotel. The location was the only downside which cannot be helped. Hindsight we wanted to be closer to the river so couldn’t walk anywhere. But the resort had organised tours which covered all the main areas to visit Kampot so we were happy. They also supplied mopeds for hire and free bicycles to use if you’re brave (we were not). We picked it for it’s affordable cost for a good quality private room with aircon whilst being in the countryside. And it gave us exactly that. Could not say a bad thing about staying here. It was chill and relaxing, Clean and great food. Everything! Staff were so helpful, facilities were awesome (natural pool, sauna, steamroom), a great exp, so much that we came back to kampot to stay again and brought friends :) will return next time in town! Pool need cleaning..swam one time only. It is quite a bit too far to walk anywhere from that place. Anything you want to do, you will need a tuktuk vor your own moto for. But we still liked it, since the moto was even delivered to that place, not a big deal. It was a beautiful and charming place. We really enjoyed the spa, especially the Jacuzzi. The personal was nice and the food delicious. They also offer vegan food. There are options to book a bus. 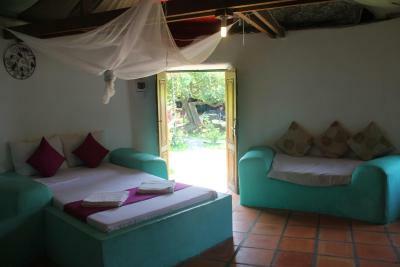 If I would visit Kampot again I would definitely go to this bungalows! Very nice but a bit expensive for what it was. Not the cleanest in the world but 👌. Jacuzzi didn't work until our last day. Classes are paying not free as said in the ad. The location is very nice, it’s quiet and green. The lady’s in the kitchen know how to prepare some wonderful food! Compliments for that. The spa area is very relaxing and nice.